Greedy goblin: Why am I in such a fail team?! Why am I in such a fail team?! Players often blame the "fail team" for a defeat. Bad players usually use it as an excuse, as the team is bad because of them. However good players also use this as an explanation for defeat. They use various metrics to prove that the team was "bad" therefore there was nothing they could do. They are right in what they say (I mean if you do 2x more damage than the average and the boss hit enrage you were in a fail team), but they are wrong in what they implicitly assume. What they assume is that God has forsaken them and thrown them into a septic tank full of terrible people who make their life miserable and there is no way out of it. This is not true. A GWPanter Self-propelled gun taught me that. Since then I'm much more optimistic and see the World in brighter light than before. Here its how it happened. I was on Himmelsdorf with my ISU-152 tank destroyer. Usually here I sit in the bottom right corner, waiting for scouts and mediums trying to outflank us. It's not far from the base either, so I can return if they got in some other lane: "Unfortunately" a pair of our Type 59 medium tanks messed up my plan. After taking a rather pointless circle around a block, they approached from my back and went up, right on the path I was camping. No point being there anymore, I followed them to shoot for them, and to shoot from the upper ground in case we capture it. So up we went. And up there we found the most bizarre sight: an enemy GWPanther. It's a Self Propelled Gun, a glass cannon with the ability to oneshot anyone from large distance, but being slow in movement, aiming and reloading, therefore easy pray in close combat. It was all alone. Type 59s destroyed it in a second and down they went on their merry way to the enemy base. Thanks to the slow reload speed of the BL-10 cannon, I had time think about what I saw. A totally retarded enemy. And I was thinking how lucky I am to have this failure on the enemy and not our team. Then it hit me: I always see what my retarded teammates do, but rarely the enemy. Besides such obvious fails, I don't have the information to evaluate if the enemy I just shot down was an idiot, unlucky or a good player who got beaten by an even better opponent. On the other hand I have all the information to see that my teammate was a completely suicidal moron. For this information asymmetry we implicitly assume that we are unfairly cursed with idiots who make the task ahead of us impossible. However all competing teams are suffering the same problem, so we are "fairly cursed". The enemy I have to defeat is just as much polluted with lolkids and morons as our team so I have every chance to win. The same applies to PvE. While we are not directly fighting another team, the content is adjusted to the average. If my LFR team hits enrage because the average DPS is 12K then the other LFR teams wipe too, so the encounter will be nerfed soon. For every good player, the statement of "I'm in a fail team" is literally correct. However it cannot be an excuse, as their presence is automatically implemented in the game difficulty. You can and shall win. Of course you must always keep in mind what you are dealing with and avoid being technical instead of anti-social. Getting epic gems have miniscule increase in the raid DPS compared to votekicking the lowest moron. A very correct observation. Retards are everywhere not just in our team. But in the case of WoT, there's one other factor that multiplies the problem: The good platoon and the lemmings effect it triggers. You've proven in a previous post that just 2 good players in a platoon can significantly tip the balance. Add to that the fact that a lot of idiots prefer following somebody they perceieve as "good" in lemming fashion, the team with the good platoon can now easily steamroll the other team. Statistically the idiot level was 13 vs 15, not much of a difference - resultwise, that game will probably end up 15:2 win for the side with the platoon. The hardest part is identifying idiots/bots like this and getting your team to not waste their time on them. Quite commonly in WoW I can tell bots or morons on the other side. But no matter how much you try to tell your teammates to let them alone and kill the people they need to (ie skilled players who are capable of winning the game regardless of their retarded teammates) they will still waste time and chase them down. This... is not a remotely correct argument. We can imagine being placed in a LFR group with the 15 worst players in the world; every other LFR group has a higher chance of success than ours, by definition. Ergo, other groups are not necessarily failing at the same rate as ours. In fact, since we have the 15 worst, we can be said to have improved the odds all of the other LFR groups. You are assuming there is an equal distribution of fail players. Evidence suggests this is not the case. "The same applies to PvE. While we are not directly fighting another team, the content is adjusted to the average. If my LFR team hits enrage because the average DPS is 12K then the other LFR teams wipe too, so the encounter will be nerfed soon." LFR will not be nerfed. Only normal and heroic will get the stacking buff. "LFR will not be nerfed. Only normal and heroic will get the stacking buff." Yeah, because LFR don't need nerf. It has 80% boss kill rate avarage. If it would be for example 20%, they would nerf it. This is a known assertion from the Tol Barad opposite faction shouts. The key to win in TB was not to stack your side with winners, but to overly stack the opposing team with more losers than you have. Your findings from that experiment were: In random grouping, the metric for who will win is not who has better players, it is only who has fewer idiots. You are in a fail team because you chose to. Going LFR/LFG is deliberatly looking to be with idiots, so if anything YOU are to blame. You have all the options available to avoid idiots (the tool is called a guild) - if you don't use it - your fault. You don't pick 10 random people from the streets for your next work project, constructing some sophistaced new machine (or whatever exactly you do on your job), do you? While the GW Panther move looks stupid, that map is about as bad as it gets for arty. Most arc of fire are cut by buildings unless you shoot along streets which mean your target can return fire in a direct way. That make many arty player got "TD mode" on this amp since it's just as effective. It's like a "lesser evil" thing in that case for me. Reminds me when playing AV in wow as both horde and alliance. I would play alliance and there would be so many idiots and the chat channels full of people complaining about their team. Swapped over to horde, and guess what? chat is full of people complaining about their team. I don't think that the whole horde heavy vs alliance heavy servers make any difference per se (the BG's are evenly matched) but by law of averages, I expect that out of the pool of available players, you will get "better people" playing depending on the server balance. WoT doesn't have this. you toss all the different tanks and people into a bucket and see what happens. I've been put on this earth by my mother in a random country, random society and therefore I should not be allowed to have any criticism or expectations to this country or society. LFR and LFD are tuned to the randomness, to a lower skill than normal. To not insult the bellow normal it is called LFR; not easy mode. And Blizzard does not appreciate calling it Looking For Retards (we call it this way on vchat: "anyone up for 'retards'?") as can be noted by blue posts. 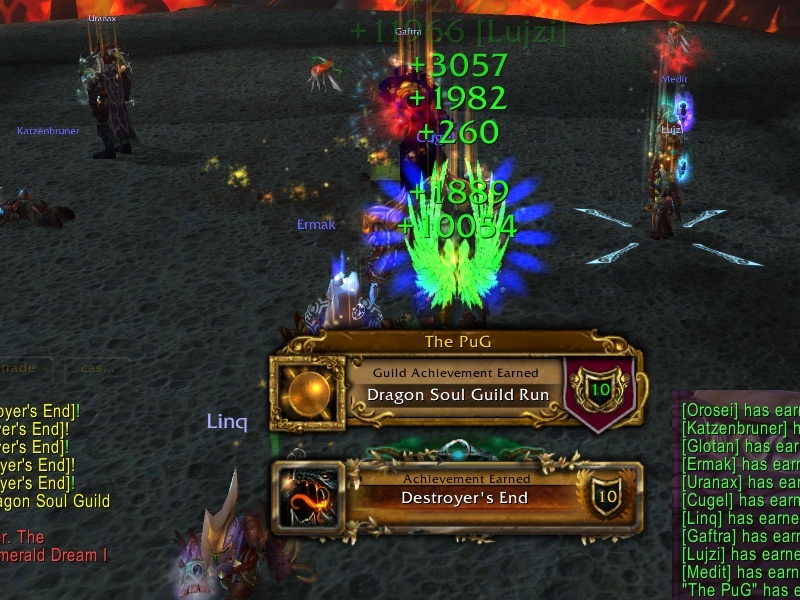 This change will allow guilds to progress when stuck, and PuGs to easier clear content. It also lowers gap between the 3 difficulties. @ Gevlon, congrats on your kill. What raid composition did you use (how many healers, tanks) and which order did you try and which order did you stick with?